The City of Dublin maintains an inventory of existing land uses within the 34-square-mile land use and fiscal modeling area (planning area) as shown in the Existing Land Use map. The planning area corresponds to water and sewer contract boundaries established with the City of Columbus. The City uses a parcel-based geographic information system (GIS) containing Standard Industrial Codes (SIC) from Franklin, Delaware and Union County databases. The collection of land use information includes a variety of sources: county and MORPC database information; Dublin planning and building databases; and other geodata, including digital aerial photography. Additional follow-up windshield surveys and photo interpretation are also used to verify the existing uses. 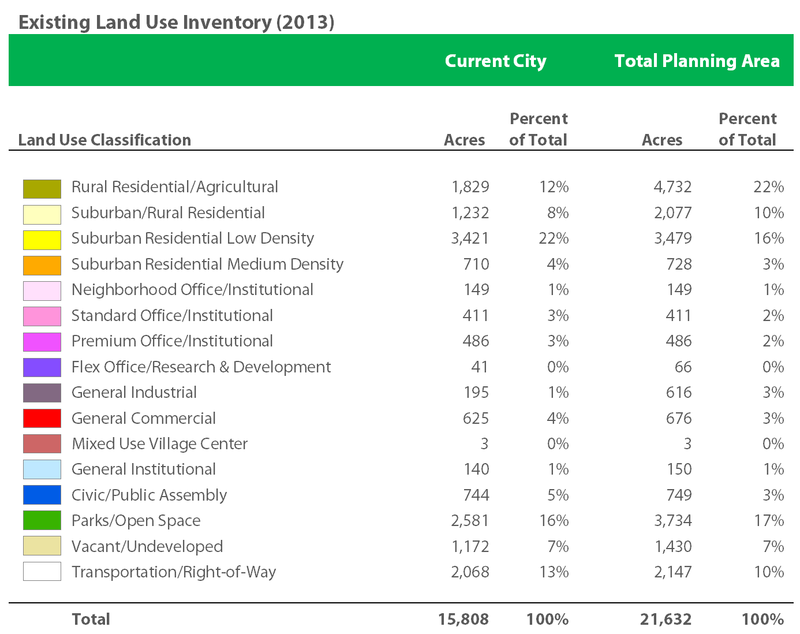 Based upon the inventory, land uses for both the municipal boundary and the total planning area are identified. Existing land uses for areas outside the planning area, but within the transportation modeling area, are compiled from MORPC data and verified for accuracy. The results of the land use inventory indicate the city is dominated by single-family residential uses. In fact, single-family residences, offices and parks comprise over half (52 percent) of the city. In the broader context of the planning area, significant amounts of agricultural land (22 percent) have yet to be developed and offer future development potential, particularly in the Southwest Area, the West Innovation District and along the U.S. 33 Corridor.